Sergio Alvarez Moya and Charmeur. Photos © Sportfot. 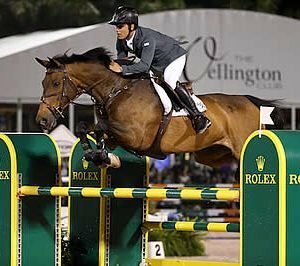 Wellington, FL – March 25, 2017 – Olympian Sergio Alvarez Moya (ESP) was the big winner in the $500,000 Rolex Grand Prix CSI 5* riding Charmeur on Saturday, March 25, at the 2017 Winter Equestrian Festival (WEF) in Wellington, FL. 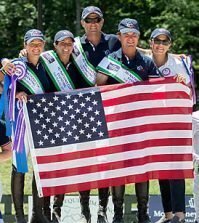 Alvarez Moya beat out two-time Olympic team gold medalist McLain Ward (USA) aboard veteran partner Rothchild, and young up-and-comer Karen Polle of Japan riding With Wings. Earlier in the night, Kent Farrington (USA) took the win in the $130,000 Suncast® 1.50m Championship Jumper Series Final riding Dublin, and McLain Ward (USA) won the 2017 Suncast® 1.50m Championship Jumper Classic Series overall. Guilherme Jorge (BRA) set the course for the highlight event of the WEF circuit featuring 40 of the season’s top competitors from 17 different countries. Five entries conquered the first round course without fault to jump-off, and only two were clear in the tiebreaker. Polle and With Wings were first to jump the short course in 39.54 seconds, with one rail down, and ultimately finished third. Alvarez Moya and Charmeur followed, setting the challenge with a clear round in 37.76 seconds. Beezie Madden (USA) and Abigail Wexner’s Coach had one rail in 40.20 seconds to place fifth. Laura Kraut (USA) and St. Bride’s Farm’s Confu also dropped one rail in 39.81 seconds to take the fourth place prize. Last to go, Ward and Sagamore Farm’s Rothchild raced through the course, taking a different inside turn that no one else tried, but still crossed the timers in second place with a time of 38.30 seconds. Alvarez Moya had a fantastic WEF circuit, placing third in week three’s $130,000 Adequan® Grand Prix CSI 3* and second in week four’s $216,000 Ariat® Grand Prix CSI 4* with G&C Unicstar de l’Aumone, third in week seven’s $380,000 Suncast® Grand Prix CSI 5* aboard Arrayan, and again third in week nine’s $380,000 Douglas Elliman Grand Prix CSI 5* with Charmeur before taking the biggest prize in week eleven. Remarking on his success, Alvarez Moya stated, “For me, this is one of the best shows in the world. Most of the best and most competitive riders in the world are here. I think that to have so many weeks here, and to be so consistent, is a great opportunity to bring a horse up like this. I have had Charmeur since he was six years old, and I just feel very happy and very proud that we got to win a five-star grand prix here. I have a feeling that this is the grand prix that every rider in the circuit wants to win, and I was just lucky that I won this one, and not the others. Saturday night concluded Alvarez Moya’s time in Wellington for the winter circuit. The Olympian, European Championships silver medalist, and reigning Spanish champion is now headed to compete in next week’s FEI World Cup™ Jumping Final with top mount Arrayan before continuing his season in Europe. For Ward and longtime mount Rothchild, the pair gave it their best on Saturday night, but settled for second place. Detailing his round, Ward stated, “I have to watch (Rothchild) a little bit on the slice to the verticals, so the first two jumps were a bit of a challenge for me. I went in and I looked at the cut inside the gazebo, and I decided not to do it. Then when I turned back on the oxer, I kind of saw the line, and I knew I was too slow one to two to have a chance, so I figured at that point it was worth the risk. I thought maybe at that point, the turn did so much that I did not have to go as fast to the last fence. I took a little bit off, but Sergio did not leave much room. Polle and her 14-year-old Dutch Warmblood gelding (Larino x L. Ronald) With Wings also finished out an excellent 2017 WEF circuit with their top three finish. The pair earned back to back victories in week nine’s $130,000 Ruby et Violette WEF Challenge Cup and $380,000 Douglas Elliman Grand Prix CSI 5*, presented by The Bainbridge Companies, leading up to Saturday night. Equestrian Sport Productions CEO Mark Bellissimo wrapped up a fantastic evening of show jumping with his remarks and congratulated the top riders. 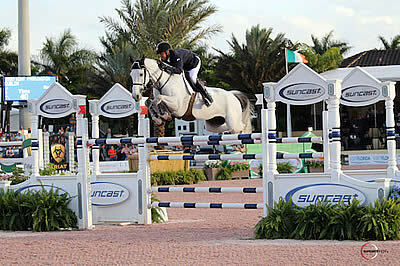 “I think there is consistently great sport at WEF,” Bellissimo stated. “The crowd has become a lot more engaged, and you can see the people really following the sport. I think there is top sport here, and we are very excited about it. Margie Engle (USA) earned the Leading Lady Rider Award for week 11, presented by Martha Jolicoeur of Douglas Elliman Real Estate. The 1.50m final held its first round on Saturday afternoon, with forty-nine entries starting over Guilherme Jorge’s (BRA) first-round course, and 13 advancing to the evening jump-off. Only four riders cleared both rounds without fault. Portugal’s Luciana Diniz was first to clear the short course in 44.26 seconds aboard her own and Arnaldo Diniz’s Lennox to end in third place. Ali Wolff cleared the track next in 48.93 seconds riding Quirie 2 to a fourth place finish. Canada’s Tiffany Foster upped the pace in 43.05 seconds with Artisan Farms’ Brighton to place second. Last to go, Farrington took the win in 41.90 seconds with his own and Tanma Corp.’s Dublin. “He is extremely careful,” Farrington detailed. “He is actually quite difficult to ride. He is so careful that he borderlines on too careful almost, where he goes too high. I think this horse really needs to bond with a rider and have a lot of confidence. I actually carry a lot of speed with him, even in the first round, to give him confidence so that he does not go too high. Saturday’s competition brought the overall Suncast® 1.50m Series standings down to the wire, but USA’s McLain Ward held onto his lead coming into the night’s event and earned the championship title for 2017. Ward qualified for the jump-off with two mounts, Tina la Boheme and HH Carlos Z, finishing sixth and seventh in the final class to secure his lead overall. For his win, Ward was presented a two-year lease on a beautiful new Land Rover Discovery Sport HSE. Ward remarked, “It feels great to win the series. It would have been nice to win the final, but the horses jumped well all winter. I had some nice young ones that really stepped up well. I am really proud of how Tina La Boheme has continued to be a great competitor, and it is nice to have Carlos back. He is still maybe a touch rusty, but close. Also competing in the International Arena on Saturday, David Oberkircher and Southfield Farm’s Castelino van de Helle won the $15,000 SJHOF High Amateur-Owner Jumper Classic, presented by Engel & Völkers. 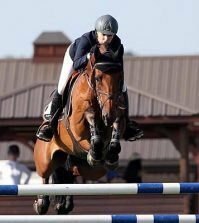 Giavanna Rinaldi topped the $10,000 SJHOF High Junior Jumper Classic, presented by Sleepy P Ranch, aboard Nuvolari Holdings’ Commissario. 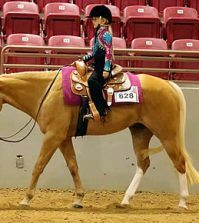 Mimi Gochman captured the championship honors in the Engel & Völkers Large Junior Hunter 15 & Under division, while her younger sister, Sophie Gochman, earned the reserve title. Both girls show out of Palm Beach, FL. Mimi Gochman piloted Scott Stewart’s Caldwell to the win in the handy and in one over fences trip, to second place finishes under saddle and in the stake round, as well as a sixth place ribbon over fences. 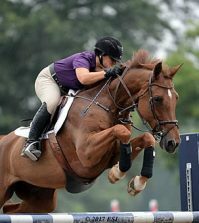 Mimi Gochman and the 14-year-old Hanoverian gelding have come a long way over their two years partnered together. Sophie Gochman guided Garfield, an entry owned by Gochman Sport Horses, LLC, to two second place finishes over fences, a third place ribbon under saddle, and a third place finish in the stake round. The eleventh week of the 2017 Winter Equestrian Festival concludes on Sunday with the $50,000 Engel & Völkers Grand Prix CSI 2* in the International Arena. The Visse Wedell, Realtor Small Pony Hunters will determine championship and reserve honors in Ring 11. For more information and full results, please visit www.PBIEC.com.